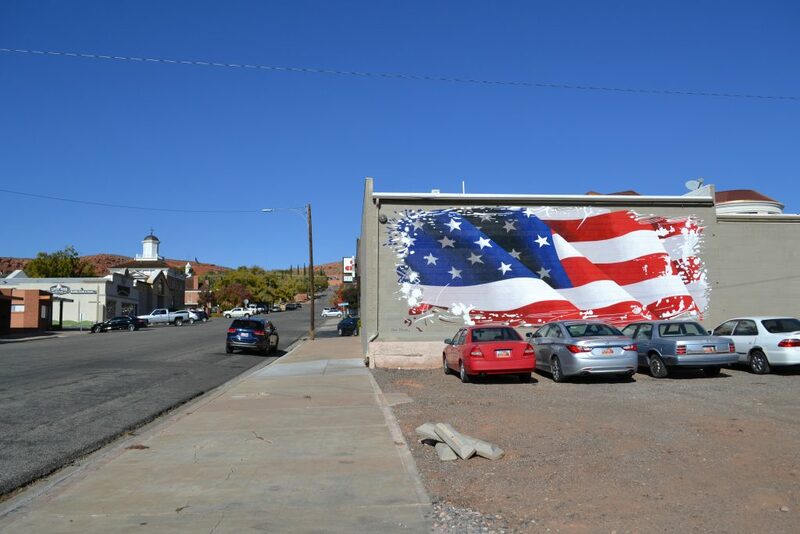 ST. GEORGE — A new mural in downtown St. George has transformed what was once an eyesore into a patriotic display commissioned in honor of the nation’s veterans. The mural features the U.S. flag covering the entire rear wall of Stapley Pharmacy, 102 E. City Center Street. “We wanted to do something to support the military and the veterans, and we thought we could put a big old flag on the wall,” pharmacist Brad Stapley said. The mural was facilitated by Rainbow Sign and Banner and hand-painted by St. George artist Dave Morris. Completed just in time for Veterans Day, the flag mural is meant to honor veterans from all branches of the U.S. military, be they Army, Army Reserve, Army National Guard, Marine Corps, Marine Corps Reserve, Navy, Navy Reserve, Air Force, Air Force Reserve, Air National Guard, Coast Guard or Coast Guard Reserve. The mural is a much-needed addition to a previously drab, blank wall that used to be hidden by an adjacent building before it burned down. The mural was covered with a layer of epoxy, ensuring that it will last at least a few years, if not a lot longer. Stapley said it’s a nice addition to the art scene in downtown St. George.